Come, sip a glass of sweet tea and sit for a spell with Ronda on the porch swing as she tells you stories of happiness and heartache, friends and family, and a faith that’s strong enough to handle anything life throws your way. As Ronda shares, Southerners don’t just talk about God, they have a “kitchen-table faith,” that feels like a comfortable, trusted neighbor who sits down and stays for a good, long visit. It’s a faith you live and breathe, day-in, day-out, whether it’s praying to the good Lord as you sit on the porch swing or finding joy in a delicious pan of cornbread. 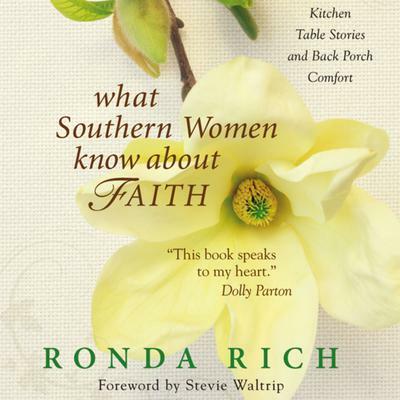 As Ronda says, Southern faith “is a faith that is plain, simple, and sturdy, that is utilitarian in practice and that fits as comfortably in the hands of Southern women as a baby, an iron skillet, a hair brush, a telephone, or a broom.” From stories of moonshine and revivals, Sunday dinners and new Easter outfits, prayers answered and griefs shared, you’ll discover a faith that supports you when the trials and heartaches of life cause you to stumble, a faith that grabs you by the elbow and steadies you on the path.